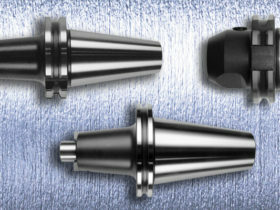 The correlation between a good milling result and the connection between the machine and the cutting tool – the tool holder – must not be neglected. Its task is to match the spindle performance with the cutting edge and to hold the tool in such a way that it cannot detach when exposed to cutting torque. The achievable restriction in radial and axial run-out and hence the precision of cutting is a key quality characteristic with significant repercussions on the surface quality and service life of the cutting edge. At higher cutting speeds and therefore greater rpm, the balance quality also acquires importance for the cutting quality and service life of the spindle. 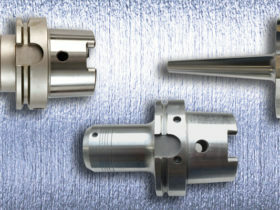 Additional characteristics such as repeatability, wear resilience, angular accuracy of the functional surfaces, including face contact, the option for internal coolant injection, rigidity, flexural load and attenuation properties, are just a few of the aspects that our premium quality tool holders satisfy and that provide decisive benefits for use. DEPO’s SK50 face contact system deserves a special mention in addition to the standard DIN ISO sizes of SK steep tapers and HSK hollow shaft tapers. 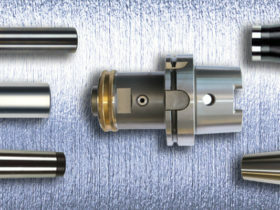 Fixed in place on the spindle nose using additional clamping bolts and supported on a large face contact surface, these systems for screw-in milling cutters and arbour milling cutters offer stable, low-vibrational machining even when cutting at unusual depths on older systems. In its short shaft system, DEPO offers a simple and purposeful solution using standard holders for special challenges regarding working depths and accessibility. The modular and precise structure using extensions and holders for shrinking and screw-in milling cutters pushes the boundaries of modern manufacturing into the smallest and deepest corner of the workpiece in a highly productive and stable form. DEPO adds that little bit extra to accomplish tasks in which others fail.